For me, I was asleep in the college dorm when someone pounded on my door, “Something’s happening in the US. You should come see.” And I sat on the phone with my dad and watched the towers fall. When the first one fell, my dad told me, “You’ve got a delay. The second one is already down.” As if he’d predicted it, the second one fell. I watched for a few hours, glued to the TV in the dorm here in Whitehorse, and then suddenly the dorm was invaded by emergency personnel. It was true. We were all being rounded up to stand on the edge of the forest. Our cooks, administrative staff, our librarians, all now had orange vests on and were our emergency guides. I was told that a hijacked airplane was coming to Whitehorse, and then, like magic, it appeared–the largest plane I’d seen there, flanked by two fighter jets, flying directly over us. If it had exploded, I would have felt the blast, ducked the debris. I remember the kindness of Yukon College. I was the only American student many people knew there, and Deby Chubb took me to her house as they closed the dorms and the college for the next couple of days. I felt so connected to my country then—but helpless to do anything as it was all happening 4000 miles away. Whitehorse has always considered itself outside the range of whatever disasters, turmoil, even politics, that happen to the south. Cities larger than Whitehorse are a good 10 hours away by car nestled in Alaska, and the nearest larger Canadian cities are thousands of miles away. We are isolated. Most of the time we’re an afterthought in Canadian politics, a swing vote occasionally, but more of Canada’s pet novelty place than a city most Canadians are thinking of. And sometimes we like it that way. If you want to get away from it all, the Yukon is a pretty good bet to achieve “Lost” status. But a global economy, global media, and now global terrorism, makes even the most isolated community connected to the rest of the world. Still, it was a strange set of events that connected one of the largest cities in the United States to one of the smallest and most remote in Canada. It was a day that Whitehorse prepared to re-enact New York City. The documentary, Never Happen Here, deftly covers the events through the lens of several parents and emergency crew as they prepared for the worst. They talk of trying to get to family; they talk about trying to get through the sudden traffic to safe spots, realizing, that in our town, all of Whitehorse is on the flight path. 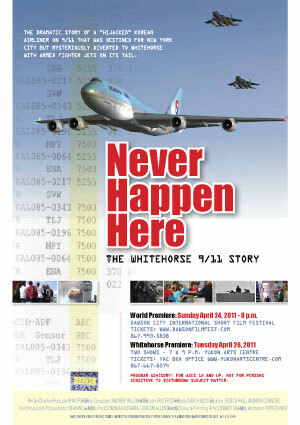 Half of the documentary deals with the moment by moment events and decisions by local residents as the Korean Jetliner 085 heads to Whitehorse. The other half of the documentary is a fantastic piece of investigative journalism by Max Fraser. Central to that investigation is why the Korean Jetliner emitted a HIJACK signal through a text message over the Pacific Ocean—and why the United States FAA ordered the plane to squawk a Hijack callsign when there was no indication otherwise that it was hijacked. This signal was a veritable death warrant to the passengers on board the plane. It allowed anyone to shoot them out of the sky. No pilot has ever been instructed to purposefully squawk that signal–but on this day, the United States ordered the Korean Jetliner to call out that it was hijacked when it wasn’t. 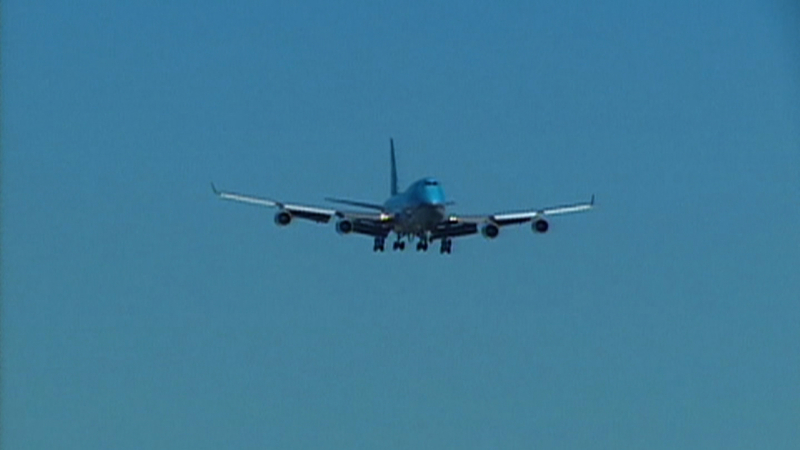 The plane was also refused at Anchorage–a place better equipped to handle a hijacked airplane, and sent instead to Whitehorse, over the border. Fraser includes interviews with Alaska NORAD, documents obtained through the Freedom of Information Act, statements by the Prime Minister, Alaskan officials. He has taped recordings of the radio conversations between the jetliner and ground control. The questions the documentary raises are huge— why was an otherwise non-hijacked plane forced to squawk a signal that said it was hijacked? Who sent the original mysterious “HJK” signal over the Pacific and why? Interviews with the captain and crew of the jetliner show that they had no idea why their passenger plane had to become a target on 9/11, considering everything that was happening in New York. And why was Whitehorse considered a more expendable target than Vancouver? Interviews with those who had the power to make decisions about the plane show that they were considering the safety of Vancouver over Whitehorse–something that just adds to our feelings here of being expendable in the National perspective. Thankfully, the events have a happier ending–at least one of relief. There was no disaster, no crash, nothing was destroyed, no one lost their lives. The passengers and crew all landed safely, were treated well, and given great hospitality by the people of Whitehorse. Still, Whitehorse has never been able to recover from the feeling that we are now only a few feet away from anything that happens down South–that events in NYC can and do effect life in Whitehorse. People here feel a bit more vulnerable, but also a bit more connected, whether they like it or not. Previous Article Is there no Sincerity in a Marketing Director?